We sat down with Micaela Kliegl & Lindsay Arentz, SAI Sicily Admissions Counselors, and Michael Cruciano, SAI President, to talk about SAI’s newest program in Sicily, Italy. Why did SAI choose to offer this program? Michael Cruciano, SAI President: The history of Sicily is astounding. We think Syracuse is a special place in Sicily, due to its past artists, philosophers, and writers. Historically Syracuse has been the main source of Sicilian contributions to society. 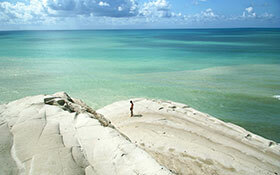 Sicily’s geography is unique in the world; where a wide variety of geological formations are found in one place. Because SAI has had programs in Sicily dating back 18 years, our resources are extensive, making the student’s experience also exceptional. All past SAI students that have studied in Sicily have explained that it truly changed them and impacted their studies and their lives. What’s your favorite thing about this program? Micaela Kliegl, Admissions Counselor: That’s an easy one…LOCATION LOCATION LOCATION! Syracuse will take your breath away. Between the labyrinth of narrow streets that make up the historical center, and the medieval castle that overlooks the harbor, all of which is surrounded by clear blue water, make this one of the most magical places. Lindsay, Admissions Counselor: As Micaela mentions, the location of our Siracuse program is phenomenal. There is no better way to describe it than a really special and historic, island vibe. Michael Cruciano, SAI President: Here, because of our history with Sicily and our network of contacts, we are able to offer a truly special educational and cultural experience. It allows us to provide students with extensive field trips related to course work, accompanied by renowned experts that have come to Sicily for their own research and work. What kind of student is best suited for this program? Michael Cruciano, SAI President: The Sicily program is for students with a thirst for learning. The opportunities for students are huge, and the city of Syracuse welcomes our students warmly. It’s a chance to truly get to know Italians (and Sicilians in particular) and there are plenty of opportunities to participate in service as well as internships. A well-rounded and independent student will thoroughly enjoy this once-in-a-lifetime experience. Micaela, Admissions Counselor: This program is best for those not looking for the hustle and bustle of a large, tourist-heavy, location. The intimate nature of the school is perfect for those who are looking to get a real cultural experience. Not only will you connect with your classmates and professors on a deeper level, but you will also become an active and valued participant in the town. I studied here for a summer and still send postcards and Christmas cards to the owners of the sandwich shop down the road. Lindsay, Admissions Counselor: Students who want to gain from the intimate classroom setting will best benefit from the Sicily program. Students who are best suited for this program will appreciate to the oceanfront classrooms and small piazzas. SAI Sicily students have a true desire to experience authentic Italian life. Tell us about the town of Syracuse. Michael Cruciano, SAI President: The town is surrounded by the sea, so the sea is entwined with your experience, whether to swim or witness how it has shaped the landscape. The food is some of the best in Italy. Since people from all over the world come to experience Sicily and Syracuse, the town is quite developed, with everything from 5 star hotels and Michelin restaurants, to the simpler needs of most Sicilians. There are regular festivals and exhibitions in Syracuse to experience, including the world-renowned classical plays put on in the ancient amphitheater each summer. Life is lived in the piazzas and cafes, well into the evening and students will find it a lively society with a lot to do. For downtime there are sports facilities, matches to watch and of course, swimming in the warm Mediterranean waters. Tell us about the housing. Micaela, Admissions Counselor: There are two housing options: student shared apartments or family home stay. Student shared apartments are located in the city center, walking distance from the school and are fully equipped with everything you’ll need to live comfortably with your fellow classmates during the program. The family home stay option further enhances the cultural experience of the program, allowing students to experience life as a local as they share in the daily customs and traditions of an Italian household. What’s your favorite class that the school offers? Micaela, Admissions Counselor: Do I have to pick just one? They are all amazing courses that fully utilize the Mediterranean location. But if I must choose, I’d say the Volcanology course that is entirely about Mt. Etna. The course explores the history, eruptions, modern volcano monitoring methods, and includes various site visits for learning outside the classroom. I took this course when I studied abroad and it was by far my favorite, most interesting course I took in all of my 4 years of college. Lindsay, Admissions Counselor: I enjoy learning about history, so the ‘Mafia: A Social and Economic History of Organized Crime’ would be my top choice. What’s something about Sicily that people may not know? Michael Cruciano, SAI President: Earliest humans in Sicily date back to 12,000 BC, making it a jewel for the study of human history. Has some of the most intact Greek and Roman ruins of anywhere. As an island, separated from mainland, its history and customs developed separately from Italian mainland, so it’s culturally quite different. For more info about the Sicily program, click here.